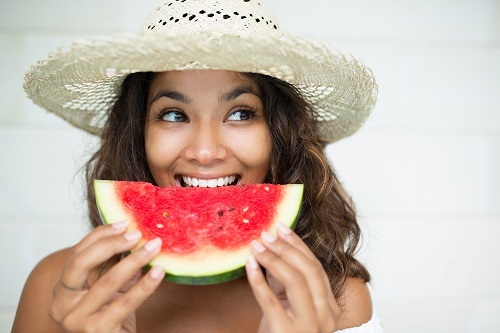 Summer weather brings delicious produce that makes your skin glow and boosts the results of your daily facial exercises. They are loaded with antioxidants, which help prevent wrinkles and boost collagen production. They also fight free radical damage and can help kill off cancerous cells. Some of the most antioxidant-rich foods are produce, so it makes sense to load up. Opt for a colorful array to target every beauty, health and anti-aging concern. Tomatoes should be a mainstay of an anti-aging diet. They are packed with lycopene, a carotenoid that combats free radicals while protecting against sun damage and harmful bacteria. Lycopene strengthens the skin by combating the activity of collagenases, evil little enzymes that breakdown collagen. It also promotes healthy teeth and gums. This dark leafy green is one of the best sources of vitamin K, which is important for cardiovascular health. Kale is another excellent source of lycopene, as well as antioxidants including phytofluene, phytoene and beta-carotene. Beta-carotene protects the skin against UV and free radical damage. It can also help your skin glow naturally! This juicy antiaging superfood is very hydrating due to its high water content. It also boasts lycopene, as well as vitamins A and C. These powerful antioxidants combat free radical and sun damage, while stimulating collagen to keep skin firm and supple. Watermelons also contain arginine, which promotes hair growth by stimulating the scalp. This purple veggie contains antioxidants and anthocyanins that help our skin glow, while boosting the fight against free radicals. Like watermelons, eggplants contain a lot of water, so they help keep the skin soft and hydrated. They are also an important source of nasunin, which has been show to help slow down the growth of cancerous cells. Red bell pepper’s bright red color is indicative of their high antioxidant content. One pepper contains more than 200 percent of your recommended daily intake of vitamin C and are a great source of folate and vitamin B6. Click through to discover more anti-aging tips and learn the benefits of about facial exercises.